FRANKFORT, Kentucky, February 14, 2011 (ENS) – Fourteen mountaintop removal mining protesters emerged Monday from their four-day occupation of the Kentucky Governor Steve Beshear’s office to be welcomed by a crowd of over 1,000 people on the steps of the state Capitol. The protesters – who included a retired coal miner, a nurse practitioner who treats miners, community organizers, a graduate student, and others – had been staying in the office since talks between them and Governor Beshear came to a stalemate on Friday afternoon. 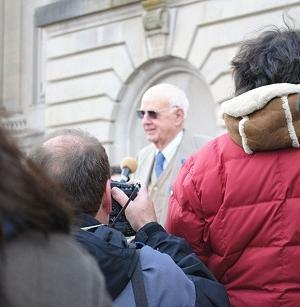 In the meeting, Governor Beshear continued to express his support for both mountaintop removal and the coal industry. The sit-in, which the protesters dubbed Kentucky Rising, has attracted international attention, with messages of support coming in from Argentina and Germany. Statements of support came from environmentalists such as Bill McKibben, founder of the climate change awareness nonprofit 350.org, and environmental writers Michael Pollan, Naomi Klein, Terry Tempest Williams, and Wes Jackson. Governor Beshear, who is running for reelection this year, met one of the protesters demands with his pledge Monday to travel to eastern Kentucky within 30 days and personally inspect damage caused by mountaintop removal. Mountaintop removal mining targets coal seams buried deep below the surface. The removal operations begin when coal companies clear forests and set the woody biomass ablaze. The mountaintops are blasted apart with explosives. Machines called draglines, some the size of a city block, the unwanted rock and dirt into nearby streams and valleys, burying the waterways. In the past few decades, more than 2,000 miles of streams and headwaters that provide drinking water for millions of Americans have been permanently buried. An area the size of Delaware has been flattened. In Kentucky alone, more than 290 mountains have been destroyed by this form of surface coal mining. People who live near mountaintop removal mining operations say their homes, properties, streams, mountains, and in some cases, their health have been threatened or destroyed.